Hitachi Seiki NK-25S CNC Turning Center w/ Hitachi Seiki CNC Controls, Tool Presetter, 10-Station Turret, 3000 RPM, 10” 3-Jaw Power Chuck, Coolant. Warner & Swasey Universal M-5940 CNC Turning Center s/n U102048/3155832 w/ GN/Fanuc GN6 Series CNC Controls, 12-Station Turret, Hydraulic Tailstock, 12” 3-Jaw Chuck, Chip conveyor, Coolant. Ikegai FX25N CNC Lathe s/n 23330T w/ Ikegai-Fanuc-FX System 6T Controls, 6-Station Turret, 10” 3-Jaw Chuck, Coolant. Ikegai FX25N CNC Lathe s/n 23335T w/ Ikegai-Fanuc-FX System 6T Controls, 6-Station Turret, 10” 3-Jaw Chuck, Coolant. Ikegai FX25N CNC Lathe s/n 23215T w/ Ikegai-Fanuc-FX System 6T Controls, 6-Station Turret, 10” 3-Jaw Chuck, Coolant, (FOR PARTS). 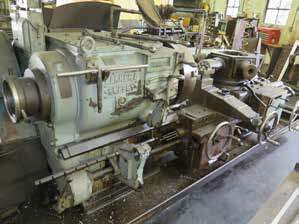 Bridgeport Vertical Mill s/n 149948 w/ 60-4200 Dial RPM, Power Feed, 9” x 42” Table. Bridgeport Vertical Mill s/n 76926 w/ 80-2720 RPM, Power Feed, 9” x 42” Table. Bridgeport Vertical Mill s/n 60162 w/ 80-2720 RPM, Power Feed, 9” x 42” Table. Bridgeport Vertical Mill s/n 64926 w/ 80-2720 RPM, Power Feed, 9” x 42” Table. Kearney & Trecker / Milwaukee mdl. 15HP-4CH Horizontal Mill s/n 12-6539 w/ 15-1500 RPM, 50-Taper Spindle, Power Feeds, 15 ½” x 74” Table. Kearney & Trecker / Milwaukee mdl. 10Hp-2CK Horizontal Mill s/n 5-6607 w/15-1500 RPM, 50-Taper Spindle, Power Feeds, 13 ½” x 56” Table. Kearney & Trecker / Milwaukee mdl. 7 1/2HP-3CH Horizontal Mill s/n 20-7113 w/ 15-1500 RPM, 50-Taper Spindle, Power Feeds, 13 ½” x 64” Table. Kearney & Trecker / Milwaukee mdl. K Universal Mill s/n 59-3735 w/ Universal Vertical Head, 15-1500 RPM, 50-Taper Spindles, Power Feeds, 12” x 56” Table. Kearney & Trecker / Milwaukee mdl. H Universal Mill s/n 1-2404 w/ Universal Vertical Head, 35-1400 RPM, 40-Taper Spindles, Power Feeds, 10” x 50” Table. Kysor / Johnson mdl. J 10” Horizontal Band Saw s/n H21004 w/ Coolant and Conveyor. DoAll 6” x 18” Surface Grinder s/n G1-45231. K.O.Lee mdl. BA960 Tool and Cutter Grinder s/n 7247-12-60 w/ Endmill Sharpening Fixture. Rutland 1” Belt / 8” Disc Sander. Powermatic 4-Head Gang Drill Press w/ mdl. 1150 Heads, 260-5300 RPM, 19” x 65” Table. Burgmaster 6-Station Turret Drill s/n ID2875. Clausing mdl. 1645 Pedestal Drill Press. Lincoln AC-225S Arc Welding Power Source. Smog Hog Porta-Clean Portable Air Cleaner. HES 16” x 62” Geared Head Gap Bed Lathe s/n 14618 w/ 36-1800 RPM, Inch/Metric Threading, Tailstock, Hydraulic Tracer Attachment, 10” 3-Jaw Chuck, Coolant. HES 16” x 62” Geared Head Gap Bed Lathe s/n 14418 w/ 36-1800 RPM, Inch/Metric Threading, Tailstock, Hydraulic Tracer Attachment, 10” 3-Jaw Chuck, Coolant. (3)Logan 15” x 40” Lathes s/n’s 7500, 6561H, 6560H w/ 55-2000 RPM, Inch Threading, Tailstock, 6-Station Turret, 5C Collet Closer, 6” 3-Jaw Chuck. Warner & Swasey No. 2AB “Optimizer” mdl. M-3380 Automatic Turret Lathe s/n 1832389 w/ Automatic Cycles, 28-1554 RPM, 5-Station Turret, (2)Cross Slides, Cutoff Slide, Bar Feed, Coolant. Warner & Swasey No. 2AB mdl. M-3925 Automatic Turret Lathe s/n 2639161 w/ Automatic Cycles, 28-1512 RPM, 5-Station Turret, (2)Cross Slides, Cutoff Slide, Bar Feed, Coolant. Warner & Swasey No. 2AB mdl. M-3380 Automatic Turret Lathe s/n 1814732 w/ Automatic Cycles, 28-1554 RPM, 5-Station Turret, (2)Cross Slides, Cutoff Slide, Bar Feed, Coolant. Warner & Swasey No. 2AC mdl. M-3200 Automatic Turret Lathe s/n 1344781 w/ Automatic Cycles, 35-1058 RPM, 5-Station Turret, (2)Cross Slides, 12” 3-Jaw Chuck, Coolant. Warner & Swasey No. 1AB mdl. M-3880 Automatic Turret Lathe s/n 3296864 w/ Automatic Cycles, 72-2026 RPM, 5-Station Turret, (2)Cross Slides, Cutoff Slide, Bar Feed, Coolant. Warner & Swasey No. 1AB mdl. M-3880 Automatic Turret Lathe s/n 2342031 w/ Automatic Cycles, 36-2026 RPM, 5-Station Turret, (2)Cross Slides, Cutoff Slide, Bar Feed, Coolant. Warner & Swasey No. 1AC mdl. M-3900 Automatic Turret Lathe s/n 2234741 w/ Automatic Cycles, 28-1563 RPM, 5-Station Turret, (2)Cross Slides, 10” 3-Jaw Chuck, Coolant. Cleveland size 5 3/4A Automatic Lathe s/n 39720-743 w/ 5-Station Rotary Style Turret, 6” Thru Spindle, Coolant. Wadell mdl. 4B-HBS Automatic Turret Lathe s/n 5160 w/ 6-Station Turret, 6” 3-Jaw Chuck. Warner & Swasey No. 5 mdl. M-2250 Turret Lathe s/n 2257627w/ 25-1556 RPM, 6-Station Turret, Bar Feed, Coolant. Warner & Swasey No. 4 mdl. M-2240 Turret Lathe s/n 212940 w/ 30-1866 RPM, 6-Station Turret, Bar Feed. Warner & Swasey No. 3A mdl. M-3500 Turret Lathe s/n 2053071 w/ 12-851 RPM, 6-Station Turret, 21” 3-Jaw Chuck, Coolant. Warner & Swasey No. 3 mdl. M-2200 Turret Lathe s/n 1732896 w/45-2262 RPM, 6-Station Turret, Bar Feed. Warner & Swasey Turret Lathe w/ 14-424 RPM, 6-Station Turret, 24” 3-Jaw Chuck, 8 ¾” Thru Bore, 24” 4-Jaw Chuck, 21” 3-Jaw Chuck, Coolant. 40 and 50-Taper Tooling and Arbors. Warner & Swasey Collet Pad Sets. Dayton & Bakewell 8” 3-Jaw Indexing Chuck. Troyke 12”, 10” and 8” Rotary Tables. (2)Bridgeport 90 Degree Milling Heads. Insert Drills, Turning and Boring Tooling. Misawa Seiki Supreme HT-1D Rockwell Hardness Tester. Mitutoyo DoAll and HDT Gage Block Sets. Sunstrand 6” x 20” Bench Center. Brown & Sharp 0-4” Bench Model Super Mic. Sunnen 2””-6”, 1.18”-2”, .74”-1.19”, .495”-.75” Dial Bore Gages. Tumico 18”-24” and 6”-9” OD Mics. Starrett 16”-20” and 2”-6” OD Mics. Mitutoyo 12”-18” and 6”-12” OD Mics. NSK 0-6” OD Mic Set. Federal 0-1” Indicating OD Mic. SPI Dial Chamfer Gages to 3”. Mitutoyo 2”-6”, 1.4”-2.5”, .44-.72” Dial Bore Gages. Mitutoyo and Scherr Tumico Blade Mics to 3”. Mitutoyo, Starrett and NSK OD Mics to 6”. Standridge 36” x 60” x 6 ½” Granite Surface Plate w/ Stand. 24” x 36” 2-Ledge Granite Surface Plate. Yale mdl. GC53-2024UF 2650 Lb. Cap LPG Forklift s/n AE059696 w/ 2-Stage Mast, Solid Tires.